I recently had the opportunity to answer five questions for the Trading Technologies' Trade Talk blog. The questions were good ones, and ones worth reflecting upon, each trader for him- or herself. One of the questions in particular dealt with who have been our greatest influences. Yesterday I pointed out that our passions reflect our values, interests, and strengths. So it can be said for our positive influences. They are influences precisely because they speak to something deep within us, crucial aspects of who we are. The people influencing us right here, right now are the experiences we will be absorbing, shaping our future selves. 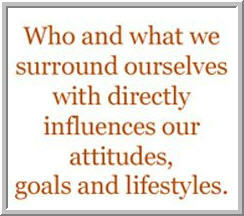 Who are our positive influences right here, right now? How can we maximize the quality of our time with them? We internalize our experiences, and we internalize the influences of those around us. Most of the time, we take our environments for granted. But we can play an important role in shaping our environment and choosing the influences that will mold us going forward. When we surround ourselves with the best, we bring out the best in ourselves.